A security guard patrol monitoring system is a win – win. 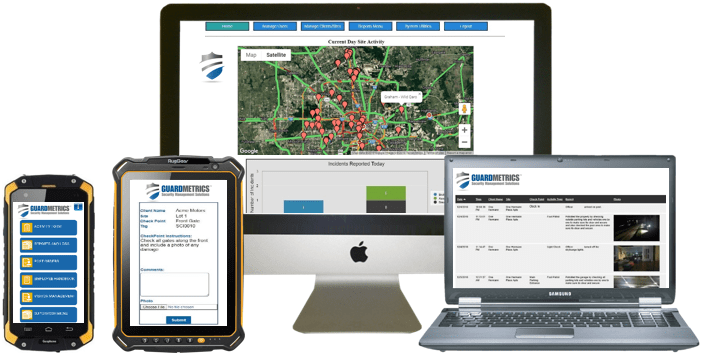 If you do not have real-time, GPS patrol monitoring in place, then you have likely experienced the frustration of losing a client who was just not convinced that your people were where they should have been, or doing what they should have been doing. This is especially frustrating for a security guard service because—besides losing a paying customer—that ex-client’s concerns now plant the seed of doubt in your own ranks. And the worst part is that your guards may well have been doing exactly what they were assigned to do, but there is simply no way to prove it without an efficient mobile patrol monitoring system. Contact GuardMetrics today at (800) 825-6858 for a guard patrol monitoring system and secure your accounts. The best security guard monitoring app for you should be affordable and simple to use, for both you and your officers. You should not need a degree in technology to use guard patrol monitoring system software—a point often overlooked by software companies who have decided to make a buck in the security industry! So, what should an affordable, simple guard patrol monitoring system do to better track your security officers? GuardMetrics was designed by experts with decades of security guard industry experience. Every DAR, Incident Report, and mobile patrol checkpoint scan is easily cataloged. It all goes into your branded “Management Portal” in real-time, where you can access it from any PC or laptop or tablet. Every event is time-stamped and geo-tagged with a satellite pic of your officer’s location. Your client can then be emailed the reports, with any relevant photos and videos attached, or you can give your stakeholder “Client Portal” access so they can access ONLY their data whenever they want. And it is all branded to your security guard company! Call us at (800) 825-6858 to demo a simple, effective and affordable guard patrol monitoring system. When your clients receive a real-time branded report from you, time-stamped and geo-tagged with your patrol officer’s location, there can be no question of accountability. Now your business can grow that much smoother and faster. That is what GuardMetrics is all about; helping you grow by helping you offer the transparency that today’s stakeholders demand. And it doesn’t stop with a great guard patrol monitoring system! Call GuardMetrics to discuss a security guard patrol monitoring system and other ways we might be of service!